Flight anxiety, or fear of flying, is essentially an excessive worry about air travel. 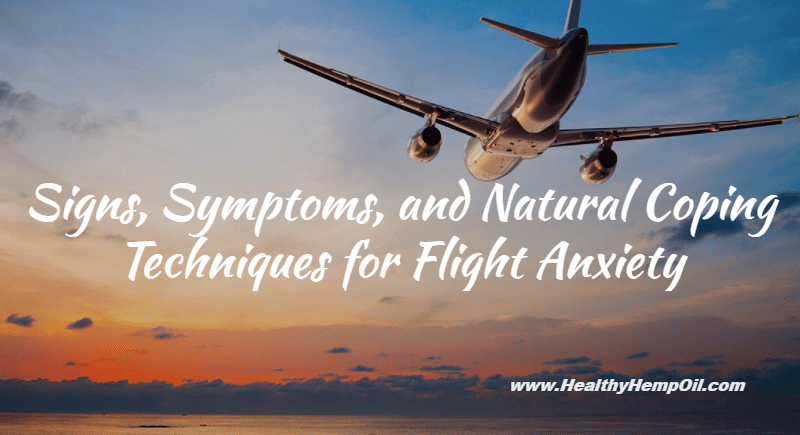 Many people may be wary of flying, but flight anxiety is a specific anxiety disorder that may lead to panic attacks, anxiety before travel, and complete avoidance of air travel. While flying is second nature to many of us, for the approximately 1 in 10 people who suffer from flight anxiety, this condition can impact both their personal and professional lives. If you suffer from flight anxiety, you may not be able to travel by air to visit family and friends, or to travel for work and professional reasons. Why Does Flight Anxiety Occur? Flight anxiety can occur as a result of a number of factors, including claustrophobia and other psychological health issues such as post-traumatic stress disorder. There tends to be two manifestations of flight anxiety: fear based on internal factors, and fear connected with external ones. If your anxieties are triggered by fear of losing control of your emotions, you may worry that you’re being judged by fellow passengers if you become hysterical, lose control of bodily functions, or make a scene. On the other hand, your fear may be based on scenarios involving factors such as in-flight turbulence, potential issues with the airplane itself, or unpredictable factors such as the weather during your flight. How Do I Know If I Suffer from Flight Anxiety? There are a number of ways to battle and overcome flight anxiety. While you can medicate using pharmaceuticals, you can also take steps toward naturally empowering yourself, such as following an anti-anxiety diet, supplementing your anxiety reduction regimen, and practicing a set of management techniques to use when necessary. While many people reach for coffee, wine, or beer as a way to regulate energy and mood, these drinks can have very different effects on our bodies and minds during flights. Your body may take longer to adjust to being airborne and may have negative affects when trying to adjust for jet lag when you drink alcohol. Instead, focus on staying hydrated with plenty of water throughout the flight, and try to eat lightly and snack enough on fruits and vegetables to keep you feeling full and energized. Envisioning disaster scenarios is not helpful. As well, all of these outcomes are almost as likely as winning the lottery. However, knowing that you have all possible information at your fingertips and that you are prepared for every outcome can be reassuring when in flight. Watch safety videos and read the airline safety card on the plane. You can then remind yourself that you know exactly what to do in an emergency. When you become anxious, it can be difficult to change your breathing patterns. Being well versed in breathing techniques can help you combat anxiety and focus your mind in a healthy way that will help relax you. Try holding your breath for a short time and then breathing deeply. Alternatively, force yourself to breathe out for an extended period—as long as you can—and then inhale deeply and slowly. Practice these methods regularly and use them if you begin to feel anxious. Distraction is a vital and powerful tool. When you go on a flight, make sure you have something familiar with you, whether it’s an item of clothing or a small blanket. A great way to distract yourself is to turn your attention to something you are already familiar with—for example, a TV show or film you’ve started watching or a book you’re reading. Jumping back in is easy and quickly engages your mind. Some people feel embarrassed by their anxiety, but there is no need to be ashamed. Informing your friends, family, or coworkers that you are traveling with anxiety allows them to check on you and be there to help if your anxiety surfaces. Sometimes, just having the knowledge that there are people there for you is enough to help keep anxiety at bay. Informing the flight staff that you’re not a fan of flying is also a great tool. They’ve dealt with nervous flyers almost every day of their career, and know how to talk you down, check on you without being intrusive, and alleviate your fears while in flight. Trust them to do their jobs, and remember that your safety is all flight attendants’ number one priority. If your anxiety extends beyond flight anxiety, it can be valuable to learn tips and techniques to cope with your anxious thoughts and triggers. Having these available will give you the power to overcome anxiety and travel freely, without adding to your stress. There are a range of natural ways to relieve anxiety that don’t involve pharmaceutical intervention. Do you have flight anxiety? Have you used any of these tips to help manage your symptoms? Tell us about how you empower yourself and overcome your anxiety in the comments.